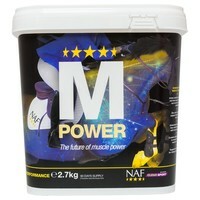 NAF M Power is a nutritional supplement to help support the natural and healthy development of muscle, strength and stamina. A unique natural formula, M Power is rich in amino acids (vital for healthy muscle tissue growth) and naturally sourced antioxidants, which work together with select herbal ingredients to ensure smooth, healthy muscle functions. These ingredients are supported by a blend of vitamins, trace elements and targeted nutrients to optimise the digestive process and enable efficient utilisation of the key muscle building ingredients. NAF M Power has also been designed to naturally support muscle development in young, growing horses, or any horse following time off from work or showing signs of muscle wastage. Introduce gradually for fussy feeders. One 20ml scoop provides approximately 10g.